The end of the road | Twende pamoja! When you look at a map of Kenya it’s striking to see that almost half of the country appears empty. Cartography has come a long way since the first map of the continent was made in 1554. Back then unexplored regions, rather than left empty, were marked with illustrations of the exotic animals explorers assumed to live there…(map lovers: have a peek at this rather awesome evolution of the map of Africa: http://libweb5.princeton.edu/visual_materials/maps/websites/africa/maps-continent/continent.html). These days there isn’t an inch of land someone hasn’t visited. No, it’s just that some areas are less “blessed” with that dominating feature of modern maps: the road. Northern Kenya is one of those areas. It’s a vast expanse of arid and semi-arid land. Roads are scarce. Tarmac ones non-existent. A visit from my favourite fellow lovers of great British explorers – Seb and Rob – proved the perfect opportunity to head there and try reach the end of the road. Unfortunately, we didn’t have extensive funding from the Anti Locust Control Unit as Wilfred Thesiger did when he undertook his groundbreaking explorations of the Empty Quarter in what was then Arabia. Nor did we have unlimited time. So we were forced to adopt the speed and ease of mechanical transport – the car – and forgo the camels for all but two days of our intrepid journey. Our journey was a loop: Nairobi – Nyahururu – Maralal – Isiolo – Nanyuki – Nairobi. We knew that after Nyahururu the tarmac would end. We knew that ideally we should learn to change a tyre in case we popped one miles from anywhere. We also knew none of us had the faintest idea about the engine of a car. But this is 2014. How stuck could we really get? 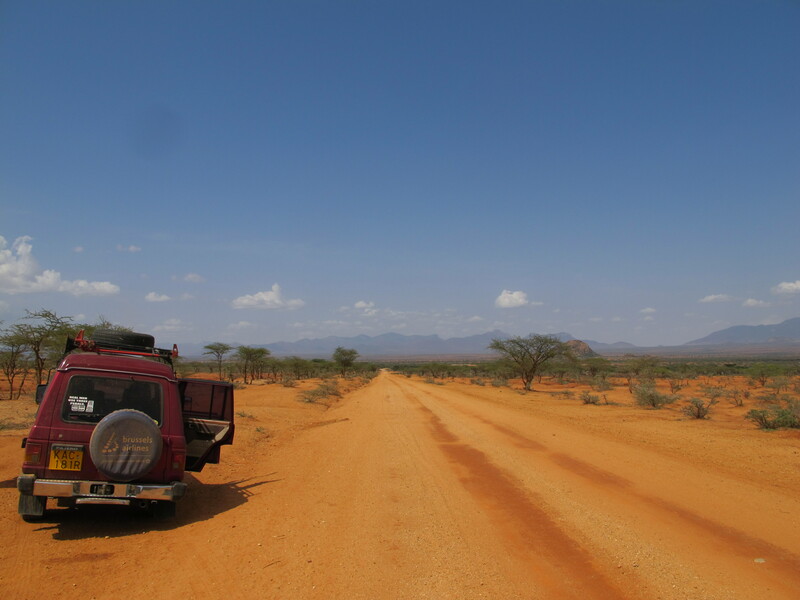 Luckily we made it to Maralal in Samburu County, the last town before the road became rocks, in a decent state. Sure the car lost power at random intervals, the brake seemed to stick occasionally and the exhaust let out a loud, unnerving bang every once in a while. But we had made it. Nonetheless we deemed it a necessary precaution to just check in with a mechanic… and the mechanic we found turned out to be one of a kind. Sadik is a Kenyan Indian whose first story, maybe five minutes after meeting, was about holding a dying man in his lap. You knew instantly that many, many more stories were going to come your way. So I was stood chatting to Sadik outside his house while the boys fetched brake fluid, when he gestured up to a room above a shop behind him and casually asked “have you heard of Wilfred Thesiger?”. Now, I just happened to be reading Wilfred Thesiger’s account of his journeys through Arabia. “Yes!” I replied rather surprised. “Well he lived in that room for the last twenty five years of his life. He was great friends with my father”. WHAT???!!! Thesiger was a mega explorer of the old tradition – the type you don’t find anymore. Most at home in situations of extreme physical hardship and cultural alienation, he was the kind of man who did things entirely his way, would likely be a nightmare in person, but inspired wonder and awe nonetheless. To think he chose to spend his last years here in Maralal rather validated our choice of holiday destination in the minds of some wannabe explorers. Of course Seb and Rob, having both read Thesiger’s accounts of his exploits, were hopping with excitement when they heard and we three keen beans followed close at Sadik’s heels as he took us to look at autographed books in his living room. A few hours later we emerged, ears ringing with stories and hearts buzzing with excitement at the coincidence. A quick Google fact check once back in the privacy of the car allayed any doubts that Sadik has stretched the truth and we set off with a newly “fixed” car to our next destination: Lesiolo Escarpment just north of Maralal. 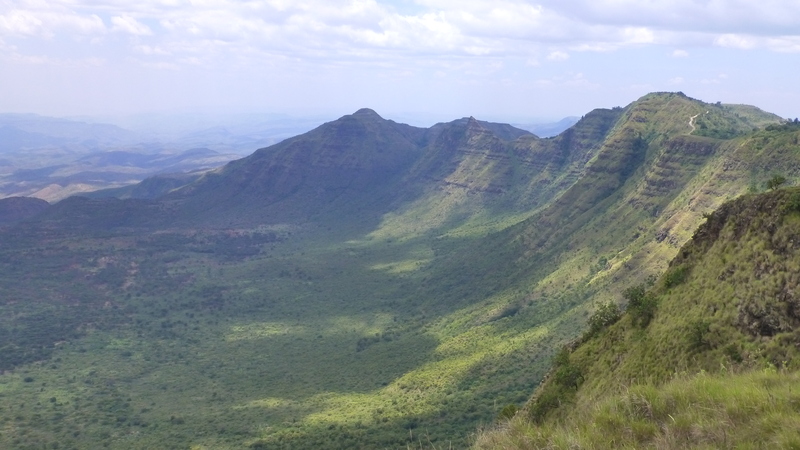 Lesiolo Escarpment is an incredible viewpoint overlooking soaring cliffs running down to the Rift Valley. The land is owned by the community and we were greeted on arrival by a group of men whose job was to be incredibly patient and wait for the few rare tourists that end up there. Once we saw the aforementioned view there was no doubt in our minds that spending a night camping was a necessity. After a brisk walk we settled down for the night around the fire with our new friends. It turned out the building we were sheltering under was a recently built peace hall. Down on the floor of the Rift Valley live rival tribes and our new acquaintances wasted no time in telling us about the to and fro cattle raids – and deaths – that had led to the building’s construction. They also wasted no time in telling us about their own encounters with Thesiger. It seems he was a well known figure in the area (hardly surprising) and was heavily involved in the tribal circumcision procedures… When the sun came up the next morning we star-struck-three, in turn, wasted no time in taking a photo under the tree where Thesiger often stood gazing out over his adopted homeland. Listening to casual tales of cattle raids between tribes I did wonder how much the men were playing up their tales to shock the tourists. But then we were sitting next to a peace hall… And living in Kenya it’s true you simply can’t get away from issues of tribal identity. It runs throughout politics (in incredibly damaging ways as anyone who remembers the violence around the 2007 elections will know) and comes up frequently in social situations. In the country, as a whole, Kikuyu and Kalenjin dominate. In Western Kenya it’s Luo and Luhya. In Samburu County… well, you guessed it, the Samburu are most numerous. These groups have stereotyped differences (Luo are apparently flashy with their swag, Kikuyu are shrewd businessmen). There are also the different mother tongues that are spoken in addition to the unifying Kiswahili and English. But in general – at least to a newcomer – it can be tricky to immediately distinguish. Not so with the Samburu. Everyone recognises the Masai in their distinctive beaded necklaces and red shukas. But I have to say the Samburu, who are the Masai’s closest cousins, are even more visually striking. ‘Moran’ is the name given to male Samburu who are post-circumcision but still in the transition to full adulthood. 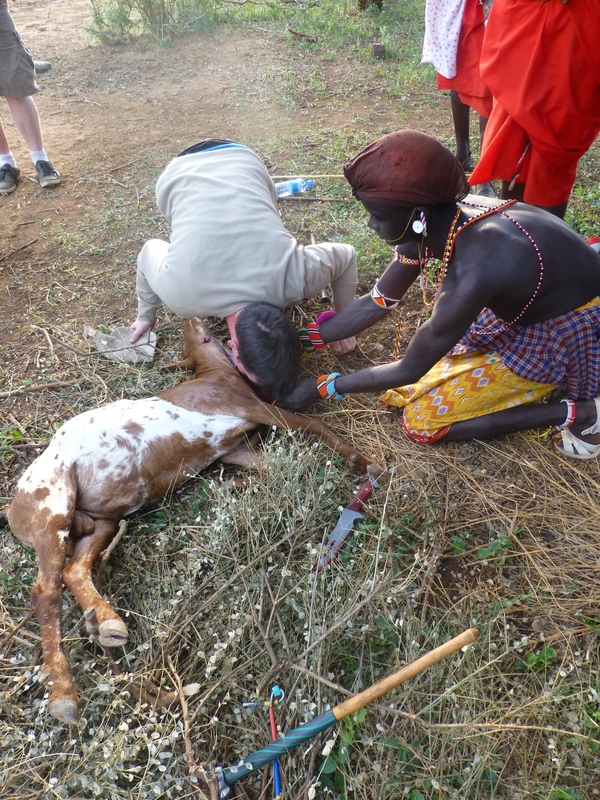 Traditionally nomadic pastoralists, it is the job of these young warriors to tend to the cattle and goat herds in the bush. They also wear the most beautiful, intricate and distinctive clothes I’ve seen in Kenya. And not just for the benefit of tourists! I didn’t manage to take any really good snaps of these stunning men (yes I’m a bit taken by the Samburu) as it seemed a bit intrusive but here is one pic below (that’s Seb drinking the blood of a freshly slaughtered goat) and for a much better illustration of what I’m talking about have a gander on the National Geographic website: http://news.nationalgeographic.com/news/2013/09/130921-samburu-moran-warrior-graduation-ceremony-kenya-culture/. So as we started the long drive back South later that morning (after push starting The Beast…), I thought about Thesiger’s words: the quote at the beginning of this blog. He said that the car would rob the world of all diversity. I’m sure to a huge, and perhaps soon almost total, extent he is right. Yet the few days we spent in Samburu County it had felt to me like we could have been in a different country to the one I’ve come to know over the last year. I found it hard to believe that Nairobi – a bustling, increasingly Westernised modern capital city – was just a few hundred miles away. The Samburu certainly aren’t letting go of their diversity just yet. Unfortunately our mechanical camel gave up the pretence of speed and ease shortly after that… After a few days of unnerving clunking noises, our steering wheel disengaged and I drove daintily into a ditch without the least bit of control. Thankfully Kenyans are resourceful and we were eventually rescued by five skilled mechanics who used a piece of wire from a nearby fence to tie the car back together (no idea how to explain this more technically). Miraculously, it lasted all the way back to Nairobi! Enjoyed reading your blogs! Keep on writing. Hi Charles! you’re testing my memory now but a quick google confirmed it is : Malasso Ecotourism Project. it’s mentioned in the Lonely Planet Kenya guidebook. Pretty tricky to find but you can ask people along the way and they will point you in the right direction. It’s a truly special place. And alas, no longer in Kenya now. Wish I was. Enjoy! Thanks a lot! Going to look into that. You’ll be back, everyone always is. Enjoy the holidays ! Am guide especially in mnt Kenya and i had four client who did mnt and safaris to lesilo view point its amazing place.its true obout the blog. Hmmmm it was a couple of years ago so i can’t remember but feel it was far cheaper than kws prices. And maybe one hour outside maralal – but again, memory hazy!